Last weekend was the family trip with some friends to Yosemite National Park. I did no running, but drank some fine Mammoth Brewing beers. Saturday, the whole family made it all the way up the John Muir Trail to Nevada Falls. If recovering from a long hike with a Mammoth Brewing Double Nut Brown Porter isn't bliss, I don't know what is. Not much else to say, but I took some nice pictures, so hope you'll enjoy them! Faithful readers of this blog (Hi Mom!) have certainly noticed the last four week I posted "X weeks to the Big Sur Half-Marathon. It was an experiment of sorts to tell a tale of my training and experience leading up to the Big Sur Half-Marathon while doing my best to avoid turning into an self-indulgent running "bus schedule". Unfortunately, despite my best efforts, the series began coming across as a self-indulgent running "bus schedule". Of course, one could argue self-indulgent posts are what blogs are all about. But I wasn't that happy how they turned out and the weekly series was taking time away from posts I was more interested in writing. So after analyzing the data from the initial experiments, I've decided to abandon the format, but not the ideas behind what it the format in the first place. I'll still be writing about the build up to the Big Sur Half-Marathon but will tell the story in a different way, which I think you'll find more interesting to read. Hope you stick around for that. "In general, any form of exercise, if pursued continuously, will help to train us in perseverance. Long-distance running is particularly good training in perseverance." Maybe a communist dictator is maybe not the ideal person to endorse the positive attributes of running, but then a guy who led a country of nearly a billion people and coerced his citizens to literally sing their praises to him is someone we ought to pay attention to. Running does indeed train the mind in matters of perseverance. I've found running helps me handle the set-backs life throws at me, as well as instilling a "stick to it-ness" to grind through difficult problems and situations. On to week four.....Monday was a recovery day, due to a work activity that wasn't going to allow me to put in any miles that morning. I still did some foam roller and course exercises before heading out for work. Tuesday was a six mile run to the Vasona Dam and back. Wednesday was supposed to be a 7 mile tempo run. I say supposed to be, because by 5 3/4 miles, I was completely fried. The plan was to go out in 6:20-6:25 pace for the first couple miles, and I got carried away that morning and at one point, was screaming down the Los Gatos Creek trail in well under 6:00 per mile pace, if my Garmin watch is to be believed. I settled down a bit to 6:15-6:20 pace, but the damage was done and shortly before six miles, I had nothing left to continue at even 6:45 per mile pace. Running too fast is better than running too slow, but not that much better. Pace sense is an important skill for running, and it takes a certain mental discipline to hold back and find the right pace automatically. I set out to do a run of seven miles at 6:25 pace, and didn't do that. The first slight clunker of a workout so far on the road to Big Sur. There will likely be a few others. Thursday was an eight mile run to Vasona Park and back. This was a slight mist in the air, that barely registered on meteorological instruments, the first fall rain of what hopefully will be a torrent. We need rain here. I felt surprisingly good despite yesterday's slight set-up. Ditto for Friday's six miler, minus the rain. I was pretty focused for Saturday's four mile tempo run on the Los Gatos High School track with my training group to get my pacing mojo back. The plan was to go out in 6:00-6:04 pace. Anything faster than 6:00 per mile pace was too fast. I clicked through the four miles with the group in 6:01-6:02-6:04-5:58. Perfect! Afterwards, we all did all warm down and Maria Trujillo, who's part of the group, and I started chatting away since we hadn't seen each other in a couple months, catching up on things. Maria was a world class distance runner in the 80's and 90's, finishing third in the 1990 Boston Marathon in 2:28. When I was in graduate school at The Ohio State University, I watched her win the Columbus Marathon. I couldn't have possibly imagined on that day that twenty years later and 2,000 miles away, we'd be talking about our autistic kids. Maria and I often compare notes on our kids autistic behaviors. Lot's of my other friends are understanding about the challenges about raising an autistic kid, but Maria and I deal with it on a regular basis. Sometimes just talking about the unique difficulties and small successes of raising our kids on our runs helps us get through it. Sunday was a sluggish and challenging twelve miles on the trails of Almaden Quicksilver Park. The legs held up, but I felt pretty trained the whole time. Still, this run was a good exercise in developing the persistence needed on race day. For an article on organic beer in the upcoming issue of Adventure Sports Journal, I did a fair amount of "research" by sampling a bunch of organic brews. One that clearly stood out was bison Bison Brewing's Hop Cuvee. It's a beer that couldn't possibility exist a couple years, at least in organic form. It's brewed with organic Citra and Simcoe hops which have only been certified organic in the last couple years. Centennial hops and a couple other hop varieties are also added into the mix. The light malt and dry character allow the hops to shine in all their grapefruity and piney character. If you ask me, Hop Cuvee stands up with the best of the West Coast IPAs. There was a time only a few years ago that organic beers were rather limited in scope, often found only in styles such as ambers or stouts. This was largely due to the fact that organic hops were hard to come by, and often had to be imported from New Zealand or England. The development of a nascent organic hop industry in the Pacific Northwest has changed that. Bison Brewing owner Daniel Del Grange has been a part of that change, organizing organic brewers all over the United States over the past decade to show hop growers the full demand for organic hops. Hop growers have responded, increasing their organic acreage and certifying new popular hop varieties such as Citra, Cascade and Simcoe. The result is that organic brewers can can create a much broader spectrum of flavors than ever before. That's a good thing because drinking organic takes a lot of chemicals out of our ecosystem that would be otherwise used to produce non-organic beer. According to Bison's website, each individual who drinks a six-pack of organic beer a week forces the conversation of 1,700 square feet to organic barley agriculture. From this figure, I calculate that if only 1% of California’s 38 million residents substituted an organic beer for a non-organic beer twice a month, it would force the conversion of 1,140 acres of land to organic agriculture. Using data from the USDA on the fertilizers and pesticides used in non-organic barley farming, I estimate this small change in California beer consumption would remove 41 tons of Nitrate, 17 tons of Phosphate, 14 tons of Potash, and 12 tons of Sulfur fertilizer from our country’s eco-system, while eliminating over 1.6 tons of pesticides. So take this as a gentle nudge from your truly to encourage you drink a little more organically. Not only will you be removing chemicals out of ecosystem, there's plenty of good organic brews out there. You'll find few better brews, organic or non-organic, than Bison Brewing's Hop Cuvee. 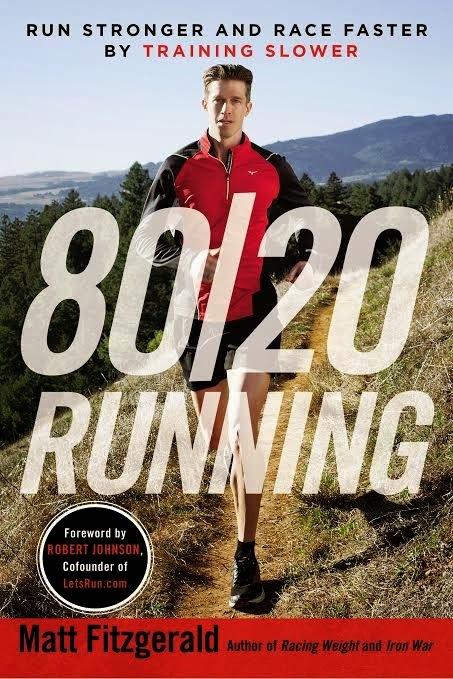 Matt Fitzgerald's latest running book, "80/20 Running" is not so much a running book but a detailed argument on how to train. Its central thesis claims optimal training results are obtained when 80% of a runner's miles are completed slowly enough to carry on a conversation, which Fitzgerald terms the ventilatory threshold. Running faster than this, which most runners consider key to improvement, should only consist of 20% of total mileage volume. Most runners, Fitzgerald argues, have this ratio out of whack, running too many miles above the ventilatory threshold and counter-intuitively, all this hard training is stifling improvement rather than promoting it. Fitzgerald cites an impressive amount of research conducted on both elite and recreational athletes to back this up and presents a pretty compelling case for an optimal 80/20 ratio of easy to hard running for achieving the best race results. Elite runners have intuitively recognized this ratio for decades according to Fitzgerald, while most recreational runners run too many of their miles fast, resulting in long term fatigue and insufficient recovery for optimal improvement. However, the book's appealing subtitle "Run Stronger and Race Faster by Training Slower" only tells half of the story. The other side to this story is that Fitzgerald is also advocating higher training volumes in his programs conducted at sub-ventilatory pace while maintaining this 80/20 ratio, so perhaps a book subtitle "Race Faster by Training Longer" would be more honest. For runners with little time on their hands, Fitzgerald's revelations will likely present a bit of a dilemma. The good news is that the author realizes each runner is different about how much time they can commit to a training program. Fitzgerald wisely tailors his ideas to runners at different levels of experience and commitment. And make no mistake, Fitzgerald is a firm believer in hard workouts. He just doesn't think running more than 20% of our miles at a pace faster than we can hold a conversation, whatever our overall training volume is, does us much good. Fitzgerald helps make it pretty straightforward to find out ventilatory threshold pace, as well as a finding other key training paces to integrate into a training program. I've read no better advice in formulating a training plan than Chapter 7 where Fitzgerald present's the "fine print" to the "80/20 rule" in the form of seven sub-rules. The book is not for those seeking to finish their first 5k or 10k, but any runner looking to improve their current performance should get a lot out of 80/20 Running. I often rate a running book by how it affects how I run. Analyzing my own training after reading 80/20 Running, I found that I'm was doing too high a ratio of fast to slow miles per the 80/20 rule. My ratio was more like 75/25 or 70/30. So I've added a few sub-ventilatory miles here and there, increasing my overall weekly miles and sometimes, have cut back a little on my hard runs. Three weeks of modification is not really enough to gauge the effectiveness of a training plan, but so far I seem to be making reasonable improvement yet still feel pretty fresh. This is something I'll likely revisit after the half-marathon is over to better gauge how moving closer 80/20 actually helped. The provocative and slightly misleading sub-title aside, 80/20 Running is an excellent guide book in finding your way to run faster. a turn-around point for many of my runs. No inspiring or thought provoking quote this week. Sometimes there's a time to look for inspiration and other times it's good to contemplate what you are doing. But sometimes it's just time to put in the work. This week was a "putting in the work" kind of week. Monday was a sluggish 6 miles. The double whammy of a 4 mile tempo run on Saturday and eleven miles on the trails taking its toll. Tuesday, another 6 miles to the Vasona Dam and back. It felt surprisingly easy and smooth running on the Los Gatos Creek Trail compared to the day before. Pretty encouraging. Wednesday was an eight mile fartlek run. On the early warm-up miles, I ran by a bunch of cats standing at attention along the Los Gatos Creek Trail, eagerly awaiting The Cat Lady, for their morning breakfast. After a couple warm up miles, it was time to run fast for 90 seconds, and then return to an easy running pace for another 90 seconds, and repeat that cycle ten times. The fast sections seemed faster than this same work-out two weeks ago, but perhaps that was just my optimistic mind playing tricks on me. The last 2-3 hard fartleks were definitely a struggle. The next day was an easy eight miles along the Los Gatos trail to the southern border of Vasona Park and back. On the way back, the runner I referred to as "Fast Grandma" whizzed by coming the other way. You know, she doesn't look quite that old enough to be a Grandma, so I'll just cal her "Fast Masters Lady". That sounds better. I also think she'd prefer this new moniker. Friday was a day of some core exercises and foam roller routines to help the legs recover, with no running. Saturday was another long distance tempo run of twelve miles. Unlike the twelve mile tempo run two weeks ago, the GPS watch had no trouble locating the distant satellites high above the earth. After an easy 7:07 mile, I settled into seven per mile pace through the six the turn-around point. Coming back home, I was hitting 6:40-6:50 miles for the last 3-4 miles. The GPS watch had me timed a 6:51 for 12.29 miles, but GPS watches tend to overestimate distance by about 2%, so I was likely just under 7:00 per mile pace for the twelve miles. Sunday was a recovery run of 8 miles that felt surprisingly and encouragingly easy, coming the day after a hard tempo run. Near the end, I encountered a middle aged couple walking their dogs who stood by the edge of the sidewalk to let me pass. The guy called out,"Nice job at Wharf to Wharf", which was odd, since I didn't recognize him. I don't know if it was a case of mistaken identity on his part, or mistaken non-identity on my part but it was a slightly odd way to to end the week. Ten Weeks to the Big Sur Half-Marathon : Too Much of a Good Thing? "Too much of a good thing can be wonderful." Mae West was assuredly referring to some hedonistic pleasure, not her weekly running mileage. I can only hope cramming in an extra run here, tacking on an extra couple of miles there a couple times each week leads to ecstasy at the finish line in ten weeks. The extra miles hopefully will add up to an increased resiliency during the last few critical miles of the half marathon. Of course, too much of a good thing can also lead to a nagging tendinitis injury. Recapping the week, Monday was a standard eight miler around my neighborhood. I felt surprisingly fresh after a tired Sunday run. 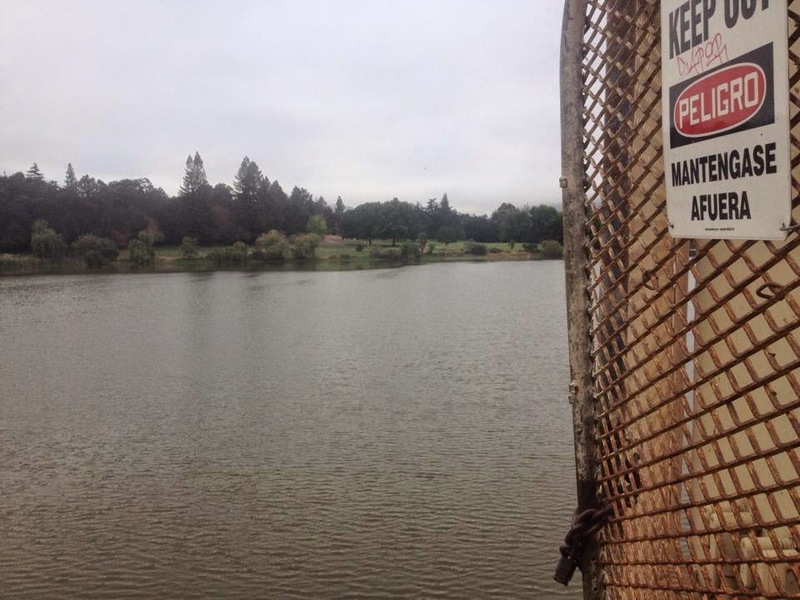 Tuesday, more of the same with a short six miler heading south along the Los Gatos Creek Trail to Vasona Dam in Los Gatos and back. Wednesday was the first big run of the week, a tempo run of six miles at sub-6:30 per mile per pace. This time, my Garmin GPS had no trouble finding the satellites unlike last Saturday's tempo run. When you think about it, it's pretty amazing those GPS watches work at all. Somehow, that small collection of electronics strapped to my wrist communicates to satellites several thousand miles away, determining my location to within about 10 feet over the entire surface of the globe. However it works, a GPS watch is great for providing the necessary feedback to developing "pace sense", an underrated mental running skill. After the accelerating during the first warm-up mile of the tempo run to 6:15 pace, I zip by the Cat Lady, a short, thin elderly lady who arrives promptly at 6:30 every morning to feed the stray cats along the Los Gatos Creek trail. A few opportunistic raccoons also take advantage of her generosity. The first three miles go by surprisingly easy at 6:15 pace as I get to the turn-around point. Heading back, thw brisk breeze hitting my face makes me suddenly realize why those early miles felt so easy. Working those last three miles against the wind, the pace slowed to 6:30-6:35 per mile. Still the overall pace for the six miles balanced out to 6:25 per mile, under the target. Thursday was a "recovery" day. Normally, I take one day a week where I don't run at all. Instead, I usually do some foam roller exercises and core exercises like planks, push-ups, and other various contortions involving an inflatable fitness ball. Before I started taking a weekly recovery day, I found myself wearing down and often got injured. I've also found strengthening my core has really improved my form which not only allows me to run more efficiently, also helps avoid injuries. Friday, it was back to an easy six miles to the Vasona Dam and back. Saturday was a morning four mile tempo run at the Los Gatos High School Track. I meet up with a training group of people I've been running with for ten years. Some people socialize over beers, some people over dinner or walks in the park. We socialize by waking up early Saturday morning and running fast for a few laps around an all-weather oval. I was hoping to run at 6:04-6:08 pace for the sixteen laps around the track. Our group of five runs tightly packed for four laps, coming through the first mile in 6:07. The pace picks up and it's a little too fast for my blood. I let a couple of the leaders go as our tight group becomes spread out single file and come through the second mile at 6:01 pace. Subsequent miles of 6:06 and 6:01 put me at 24:16 for the four mile run, exactly 6:04 pace at the lower end of my target. Encouraging. During the cool down, we talk about one member of the training group who didn't show up that morning, hasn't been running much lately, and lately has gotten noticeably depressed. Some of us are little worried over this development. We talk about difficult times in our lives, and how running helped get us through those periods. After the cool down, we head over to Peet's for coffee and a scone and talk about our upcoming races and that plane flew for thousands of miles after the pilot lost consciousness and crashed into the Caribbean. Sunday was an eleven miler through the hills of Almaden Quicksilver Park. As I ascended the main hill in the center of the park, on my right looming through the light fog were the gentle outlines of the Santa Cruz Mountains. On my left was the urban sprawl of San Jose, the downtown skyscrapers barely visible. The rugged hills of Quicksilver are a great place to develop balance and leg strength, as each stride on the rugged hills and uneven footing is always different by necessity. It's also a great place to escape the city for a couple of hours. This month's Session is a very Belgian one from Belgian Smaak who asks us to share our experiences with our first Belgian beer. In the free wheeling experimental and inclusive nature of Belgian beer, "the rules are that there are no rules". So when writing about our first Belgian beer, we don't have to write about our first one, or even a beer actually brewed in Belgium. That makes me highly tempted to write about the time my high school girlfriend scored a couple of stale cans of Strohs on a date, the was the first beer I ever drank. Well, the first beer I ever drank if you don't count a few sips of Rolling Rock my dad periodically allowed me to try from his glass. However, it just doesn't seem right to twist that beer experience into this Session. Instead, let me tell you about the first Belgian beer I remember drinking, Brother Thelonious from North Coast Brewing. It was on a trip through California's Mendocino County over seven years ago where my wife and I stopped at North Coast's brewpub across the street from their production brewery in Fort Bragg. I still remember my surprise at it's intense banana fruitiness, calling it "banana beer". I was just discovering all the possibilities of craft beer then, and this "banana beer" was a big part of that discovery. Revisiting a couple bottles of Brother Thelonious last week, I found it to be have plenty of fruitiness but more like prune than banana with some dark malt roastiness, and light aromatics one associates with Belgian ales. I'm not sure exactly what "banana" I was tasting with those first sips of Brother Thelonious back then with, but this beer remains a discovery. OK, since this beer is brewed in the United States, is really isn't a "Belgian beer", a non-issue for our Session host, but a distinction that's gotten Stephen Beaumont into a lather. Which raises the question: How is it that only Belgium and no other country has transferred its nationality to any American beer inspired by its brewing traditions? An American brewed Hefeweizen is hardly considered a German beer. At least it's no more German than an American brewed Bitter is British, or an American Pilsner is Czech. Does this Belgian nationality transfer phenomenon hold true in other countries besides the United States? I realize tedious hair-splitting is what gives beer writers something to write about, but is it too much to ask ourselves why this happened rather than go around slapping peoples wrists whenever they declare something "Belgian" even when it actually isn't from Belgium? Well, the problem is, I really don't know why or how the country of Belgium achieved this impressive feat of national identity transfer and nobody else seems to know either, so maybe we should go back to all the tedious hair-splitting. Except our Belgian Session host has no interest in splitting hairs, so maybe that should tell us something. Very well. My first Belgian beer I remember that was actually from Belgium was none other than Chimay Grande Reserve Blue paired with bread pudding at a beer and dessert pairing a couple years later after that trip to Mendocino County. Beer and dessert pairings seemed a little novel way back in 2009, and once again as I further discovered beer's many possibilities, a Belgian beer was a big part of that.